Tammy and Eric met while working with each other in Fort Jackson, South Carolina. They fell madly in love and decided to marry. However, wanting to skip the crowd, they decided to elope. Neither wanted the cliché Vegas chapel wedding. After seeing shots of Red Rock Canyon, Calico Basin at Red Rock seemed the perfect place to get married. Both love the outdoors and really wanted to incorporate the beauty nature into their special day. 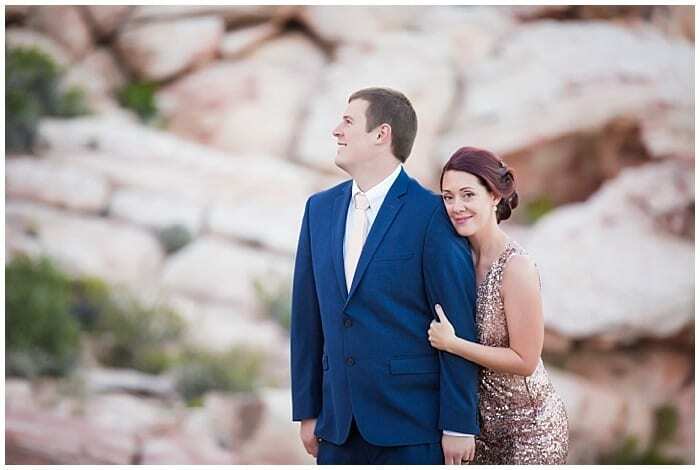 When considering locations, Tammy and Eric considered the colors at Calico Basin to be stunning. For this reason, they decided the location would be perfect for a sunset wedding. The incredible mountains coupled with the gorgeous landscape, this premier elopement destination satisfied all this southern couple’s wants. Wanting to concentrate on each other, and not on a large amount of family and friends, Cactus Collective photographer McKenzi Taylor was able to capture just this. In every photo, the love for each other is obvious. With just two guests, this couple was able to focus on each other and join together in a small and very intimate setting. 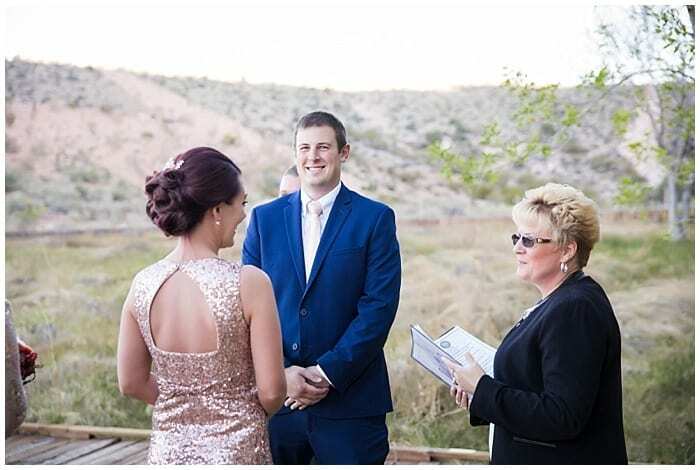 The couple stated that one of the best parts of the planning process was looking at sample photos taken in the area and planning how they would tell loved ones following their elopement. Well, they seem to have really pulled it off! This affair was about only them and they were left with photos and memories perfect for surprising family and friends of their exciting news. 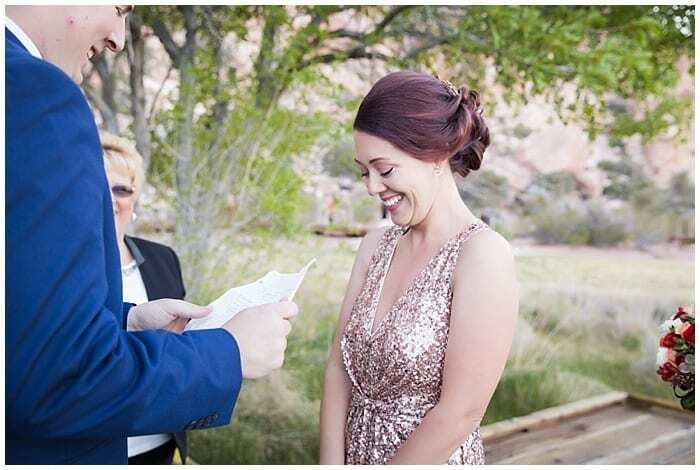 On the Calico Basin boardwalk, Tammy and Eric exchanged their vows, ecstatic to be becoming husband and wife. Glowing throughout, and radiating happiness, this day became their most perfect day. The couple vibrantly stood out, even among the incredible beauty of the setting surrounding them. The couple’s true selves were captured in every photo. The personality of each, Tammy in her sparkly gown and designer pumps to later, lace up hikers, and Eric from sleek loafers to sporty, casual sneakers, showed through perfectly. However, even without the designer duds, the sparkle in their eyes was enough to light up the entire night. Both the couple and the ceremony was charming and elegant. 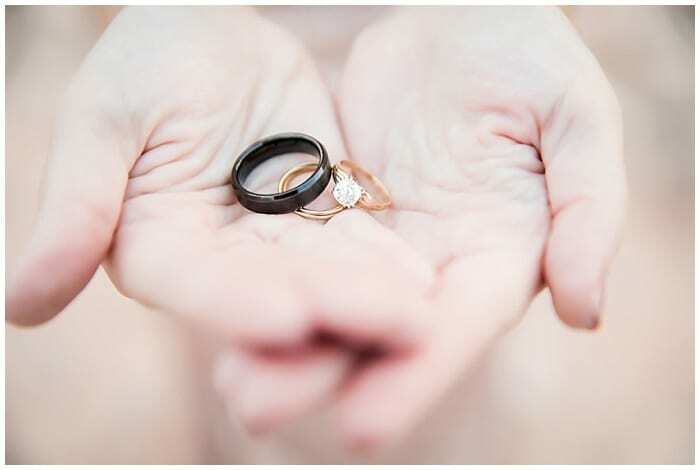 Everything from the bride’s bouquet to the wedding bands complimented the happy couple. Working with those at Cactus Collective, they created a wedding perfect and unique to them. When asked what advice they have for other couples planning their big day, both say, “Prioritize what you and your fiancé want over everything else, even if it’s not the normal wedding plan.” Although eloping is not for everyone, for this couple it was the best decision they made in regards to their big day.